T1: You know, I’ve been teaching here for quite a long time – almost five years. But now I’ve got a feeling that I mightn’t be doing everything I could do. And I doubt that my students are happy with my lessons. What do you think I should do? T1: Oh, that’ll be good. Thank you! T2: But you know what? T2: Why not to ask your students? T1: What do you mean? T2: I mean to ask the students if they’re enjoying your lessons and what they would like to improve about them. T1: Hmmm. Do you think it’s appropriate? Well, I must think about it. If you’ve come to the point as Teacher 1 in the above dialogue when you aren’t sure that your lessons meet the interests of your students, why not to ask the students themselves what they think about your teaching? It takes courage but it pays off. The only prerequisite is open-mindedness, the ability to take criticism and to be ready to change. What is your general impression of the lesson today? What part of the lesson did you like in the class today? Why? What part of the lesson did you dislike in the class today? Why? What would you like to do in class next week? I slightly modified the original questions and turned the homework task into a classroom activity. I decided to ask students to complete the questionnaire right at the end of the lesson for two reasons: first, to ensure that everyone present gives the feedback; second, to strike while the iron is hot and the students remember the lesson clearly. The students were given 7 minutes at the end of the lesson to answer the five questions of the survey. I should say that my students were pleased and slightly surprised at the fact that a teacher gave them an opportunity to express their opinions and wishes about the lesson. The students’ surprise was quite understandable as it isn’t common here in Russia for students to be asked to give their opinion on what their teacher is doing and what is more to suggest any improvements. 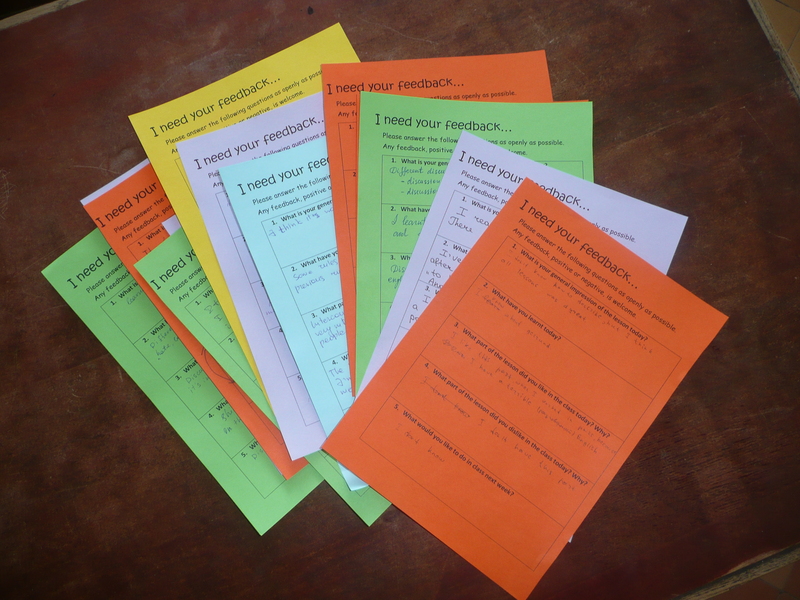 To make this survey more attractive for the students, I prepared colourful answer sheets. Here we can see a photo of them. The students could choose an answer sheet by the colour they liked. This didn’t fail to add even more fun to the activity. I must admit that on the whole my students liked the activity. And though there were some students who were doubtful about what to write, which I attribute to the novelty of the task, most students had so much to say that 7 minutes seemed too short for them. In fact, I enjoyed doing the survey. For me it’s been very tempting and exciting to find out what other people think about what I’m doing, especially if these people are the target audience of my activity. After all, if you’re confident in what you’re doing you have nothing to be afraid of. Students aren’t going to pan you. Rather, they’ll be pleased with the chance to be heard and with the understanding that their opinion is valued and trusted by their teacher. On the whole, it was a very positive experience. In my opinion, such survey can be a really useful thing. For a teacher, the survey gives immediate feedback on their lessons and teaching methods. Thanks to the survey, a teacher can quickly adjust the content of the lessons and/or the style of teaching to the needs of a particular group of learners. Moreover, learners’ responses may prompt some fresh ideas to be used in the classroom and may trigger the teacher’s professional self-evaluation and self-reflection. The survey could be an indispensable help for a teacher who wishes to be (or become) a flexible, open-minded and sensitive to learners’ needs professional. On the other hand, learners can benefit from the survey too. First of all, such questionnaires give learners the opportunity to be an active part of the learning process and influence to some extent what goes into the lesson and the way the lessons are conducted. But what is more, the survey may help learners to develop their autonomy in a way that they become more aware of their needs and what they can take from lessons. I believe, such brief questionnaires can provide a lot of motivational stimuli to learners and make them feel that their opinion and needs really matter. I’m sure I’m going to use this sort of feedback activity with my other groups too. I thank Chiew for suggesting such a brilliant idea. And I also thank my students for taking part in the survey and being honest with their evaluation of my lesson. So, why not to ask your students? 🙂 Do try this survey out and see how it’ll work for you. I would be very much pleased if you share your results and ideas how this survey could be improved. P.S. If you got interested in the survey, you may find it interesting to read my next post on the same survey which gives a more detailed description of the activity (see https://eltdiary.wordpress.com/2012/06/08/who-to-ask2-or-what-do-students-want/). Thank you Sasha for a lovely post! I can tell from my own experience that it really works. I start and end every course with something similar. At the beginning it helps me to get oriented and learn more about my students, it helps them to realize what they expect from the course and at the end we can recap the course, make suggestions and encourage each other with the ways to work in future. Thank you again! I agree with you on this. I’m so pleased that my suggestion has inspired you to try it out with your students! I like how you managed to turn it into a ‘fun’ activity! Congratulations! I can’t wait to read about the results! Thank you, Chiew! 🙂 I’m pleased to be praised by the author of the idea! I’m glad you liked the way I applied it. Great post! Feedback questions are a good idea to motivate our students (especially school students) who are reluctant to talk at the lesson. You are absolutely right it’s not common in Russia. I also use this method and my students not slightly but very surprised (and pleased, too) when they are asked to share their opinion because they don’t actually used to it. Good luck in your future work! Thank you, Larisa! I’m glad we share the same opinion 🙂 What is more, Russian students are not only used to first form and then share their opinion but also to express some healthy criticizm. I soon be sharing my experience with another activity I have been doing with my university students for 3 years now and will tell my readers about the problem with collecting students’ true opinion. This problem has two roots: First, it’s a tradition in our country either only praise (very often in the form of flattery) or to severely criticize someone forgetting to mention positive things as well; Second, students are reluctant to express criticizm because their grades depend on the teacher. For these reasons, it’s more beneficial to develop and use an anonymous and, even better so, an electronic form (to avoid identifying a student by their handwriting) for the feedback.